Sir Walter Raleigh (c. 1554–29 October 1618) was an English aristocrat, writer, poet, soldier, spy, and explorer. He helped make tobacco popular in England, especially among people in the royal court. Raleigh was born to a Protestant family in East Budle, in Devon, the son of Walter Raleigh and Catherine Champernowne. 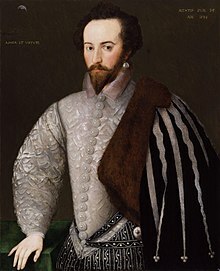 Walter Raleigh was married to a woman called Elizabeth Throckmorten. He had 3 sons named Damerei Raleigh, Walter Raleigh and Carew Raleigh. In 1594, Raleigh heard of a "City of Gold" in South America and sailed to find it, writing an exaggerated story of his trip in a book. He explored North Carolina all the way down to Florida. This book made people believe in the legend of "El Dorado". After Queen Elizabeth died in 1603, Raleigh was put in prison because he was accused of trying to overthrow King James I, who did not like Raleigh. In 1616, he was released to go look for El Dorado again. This was unsuccessful, and Raleigh's men attacked a Spanish outpost. He returned to England. The Spanish were upset, so to calm them, England arrested Raleigh and executed him by beheading (decapitation) on 29 October, 1618. ↑ "Sir Walter Raleigh". Nndb.com. Retrieved 20 March 2014. This page was last changed on 14 February 2019, at 17:22.